That approval never came in her lifetime. Dickinson wrote nearly 1,800 poems, of which less than a dozen were published before her death in 1886 from Bright’s kidney disease. Born 55 years earlier, Dickinson never married. She remained sequestered, mostly by choice, within the family homestead, her younger sister Lavinia (known as Vinnie), by her side, her older brother and his family next door. Dickinson rarely ventured out and, as her illness intensified, barely left her bedroom. A life with so little action might prove challenging to transfer to the screen. But not for Davies, who often sets his films within confined interior spaces and has never failed to make the inner lives of his characters compelling, in part, because his films — all highly stylised period pieces — strive for authenticity of feeling above all else, the opposite of many a staid, frigid period biopic. A Quiet Passion is less interested in what Dickinson did and where she went than in what she thought and how she felt. To uncover these mysteries, Davies makes use of the poems which voiced Dickinson’s desires and fears with a unique grammatical form. Nixon’s expressive readings fuse with Davies’ classical and traditional musical choices, and like them, follow an emotional logic. Each note falls in exactly the right place. Dickinson’s was a brilliant mind. By narrowing the action to the spaces in which her mind thrived — her bedroom and her writing — Davies’ precise, compassionate storytelling really comes alive. You feel that Davies understands Dickinson — her spiritual quest, her grief over change and her complex relationship to home. As Davies’ early, autobiographical films reveal (Distant Voices, Still Lives , The Long Day Closes ), these crises have been his too. He appreciates how seemingly minor slights wounded the poet. Dickinson taking second prize in a baking contest is a near catastrophe. Nixon, her expressive face drawn tight, contains her rage at the news. She appears, just as Dickinson describes life to be like in Poem 601, as “A Still — volcano.” On other occasions, that volcano erupts, “Earthquake Style,” in many of Dickinson’s vicious bouts of criticism of herself and others, usually in the presence of her sympathetic sister Vinnie (an excellent Jennifer Ehle). Such torrid explosions of feeling, alongside Dickinson’s acute awareness that she is her own worst enemy, allow A Quiet Passion to transcend the clichés of the troubled artist subgenre of biopics. Dickinson is no caricature of furious creativity. She is neither angel nor demon, simply a flawed woman hungry for greatness, stifled by patriarchy and miserable in her anonymity. Importantly, Davies isn’t interested in perpetuating the popular and sexist image of Dickinson as a reclusive scribbling spinster, forced into a life of solitude and letter-writing due to an absence of conventional womanly charms. He understands that in her isolation the stakes were far greater — bound up with her very self-determination. 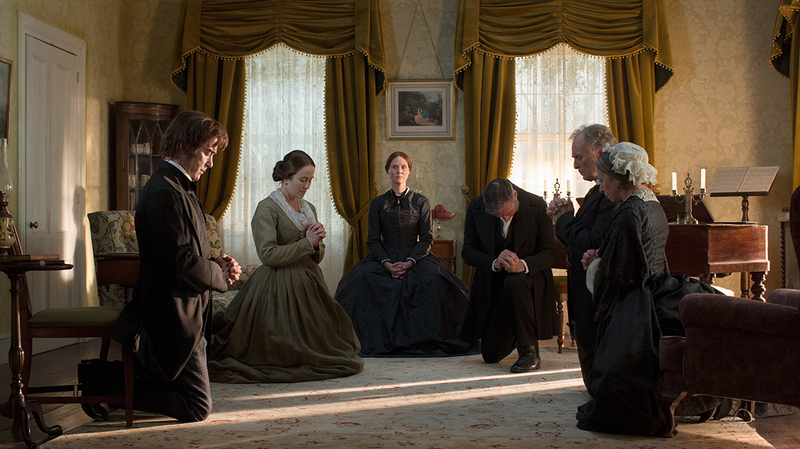 From its opening scene, A Quiet Passion sees Emily Dickinson as a woman in charge of her own mind, speaking back to authority. “You are alone in your rebellion,” her teacher at Mount Holyoke Seminary cruelly declares. And for much of the film this seems true. Defying her father (Keith Carradine), she refuses to attend church, declaring, “My soul is my own.” When he dies, she skips the funeral and wears white. In an early morning conversation with her sister-in-law, Susan (Jodhi May), Dickinson — who sought and won permission from her father to sit up and write from 3am until dawn — lays out the reality of what she has gained and lost in devoting herself to the writer’s routine. Davies views Dickinson’s radical solitude as both blessing and curse. “I can’t imagine myself beyond my family. Amongst strangers,” Dickinson tells her friend, the proto-feminist, wonderfully christened, Vryling Buffam (Catherine Bailey). Davies highlights both the courage and tragedy in Dickinson’s decision to stay — a highly social, witty woman, who becomes more bitter the further she retreats from society. A Quiet Passion is also surprisingly funny, the banter between Dickinson and Buffam often arch but vital to depict these intelligent women as more than decorative drawing-room flowers. When Davies excises that humour from the script, we feel its loss. Davies builds Dickinson’s yearning into the film’s fabric. It’s there as she waits for a word of praise from Reverend Wadsworth (Eric Loren) as he reads her poetry. And it propels an extraordinary sequence in which Dickinson imagines a man climbing the stairs to her room at night. While her chamber became her prison, Davies suggests it was also the site of her most powerful liberating tool — her imagination. Moments of rhapsodic beauty like these are contrasted with the horrors that besiege everyday life. This takes the form of Dickinson’s quickening, excruciating illness. The film’s first half is striking for the crisp, clear light flooding through the homestead’s huge windows. But this shifts. Cinematographer Florian Hoffmeister (who also shot The Deep Blue Sea  for Davies) parallels Dickinson’s darkening physical state. He turns the lights down, bringing the sensation of walls closing in and time running out. Unable to film inside the Dickinson homestead, only on its grounds, Davies built a replica, room for room, in Belgium. In the end, this hardly matters. What the filmmaker erects with the utmost authenticity are the multiple compartments of Dickinson’s soul. It might have been physically confined to the space between four walls while she lived, but in A Quiet Passion it soars free, beyond and above them, and can’t be stopped by death. Joanna Di Mattia is a writer and film critic based in Melbourne. She is currently researching a book about Terence Davies’ films.